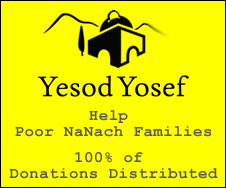 Na Nach Nachma Nachman Meuman: We love the Nanach store! We love the Nanach store! Today a girl from a local cemetary - Shaarei Bena - bought a Nanach bracelet at the Nanach store in Tsfas, she was ecstatic about how cool the Nanach store is, and offered to scrub the floor in return for one of the holy books of Rabbainu. some of my favorite people are in local cemetaries:) NN! don't know about the first song your talking about, but I think I have an idea about the second one. It is on one of the Keren's disc, it sells for 30 shekel. nanaach did u ever end up getting thw song miriam was was walking about,i heard it also and im really digging it,did it come to u since her question? Michael, sorry, the first song, B"H I am not familiar with the original song, and the second one is too vague. The thing is that B"H last year the Keren put out a how bunch of amazing discs, and the truth is at their amazing sale price of 2 for 50 shekel, I highly recommend that you splurge and buy all of them. B"H on the Nanach.net music site you can get Hazamir's music, which is mostly taken from secular music and remixed and elevated to Nanach, maybe the song is there. is hazamirs music avaible for like a 30 second preview anywhere,are his tracks avaialble to hear in short,bec i want to listen before i buy something?